Edelbrock Nitrous System - EFI Wet System - Dezod Motorsports Inc - Home of the automotive performance enthusiast since 2002. One direct-port style nozzle injects both nitrous and additional fuel metered by tuning jets into the incoming air charge. Designed for Edelbrock Performer RPM Pro-Flo EFI systems using our 4V air valve, these Nitrous Systems include a 10-lb. 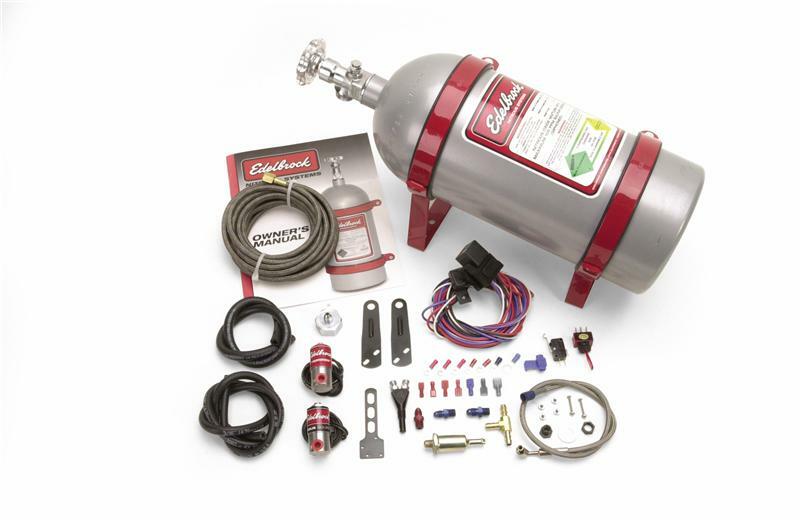 capacity nitrous bottle (shipped empty), nitrous and fuel solenoids, billet spray bar plate, aircraft quality steel braided hose, nitrous filter, stainless steel jet selection, aircraft quality fittings and all necessary switches, brackets, hardware and owner’s manual for a complete installation. Performer EFI Nitrous Systems are the best way to get a major power increase in your fuel injected late-model street machine. These systems work with your stock ECU for a simple installation. “Wet” systems use a direct-port style nozzle to introduce nitrous and fuel into the intake runner.